Content creators and broadcasters are increasingly embracing Cloud’s global reach, hybrid model and elastic scale. These attributes combined with AI’s ability to accelerate insights and time to market across content creation, management, and monetization are truly transformative. At the International Broadcasters Conference (IBC) Show 2018, we are focused on bringing Cloud + AI together to help you overcome common media workflow challenges. Video Indexer, generally available starting today, is a great example of this Cloud + AI focus. It brings together the power of the cloud + Microsoft AI to intelligently analyze your media assets, extract insights and add metadata. It makes it easier to understand your vast content library and get the more than 20 new and improved models, easy to use interfaces, a single API, and simplified account management. I have been part of Video Indexer team since its inception and could not be more excited to see it reach GA. I’m also incredibly proud of the work the team has done to solve real customer problems and make AI tangible in this easy to use elegant solution. Our partners are already innovating on top of Video Indexer and extending Azure Media Services to advance the state of the art in cloud-based media services and workflows. You can learn more about Video Indexer and our new partner solutions below. You can also check out Tad Brockway’s IBC blog to learn more about new solutions from Azure and our partners that enable compelling workflows across the media value chain. At IBC 2018, we are thrilled to announce that Video Indexer (VI) is generally available and ready to cater to our media customers’ changing and growing needs. 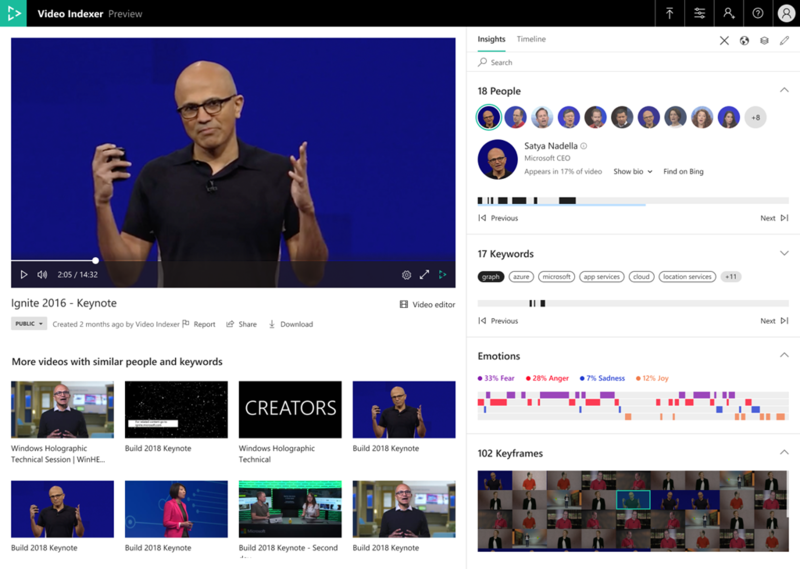 Announced as a public preview at Microsoft’s Build 2018 conference in May, Video Indexer is an AI-based advanced metadata extraction service. This latest addition to Azure Media Services enables customers to extract insights from Video and Audio files through a rich set of Machine Learning algorithms. Those insights can then be used to improve content discoverability and accessibility, create new monetization opportunities and unlock data-driven experiences. At its core, Video Indexer orchestrates a cross-channel machine learning analysis (audio, speech, and vision) pipeline for video and audio files, using models that are continuously updated by Microsoft Research. These models bring the power of machine learning to you, enabling you to benefit without having to acquire expertise. Furthermore, our cross-channel models enable even deeper and more accurate insights to be uncovered. Customers and partners such as AVID, Ooyala, Dalet, Box, Endemol Shine Group, AVROTROS, and eMAM are already using the Video Indexer service for speech to text and closed captioning in ten different languages, visual text recognition (OCR), keywords extraction, label identifications, out of the box and custom brand detection, face identification, celebrity and custom face recognition, sentiment analysis, key frame detection and more. At GA we are, of course, adding new capabilities. The Emotion recognition model detects emotional moments in video and audio assets based on speech content and voice tonality. Our Topic inferencing model is built to understand the high-level topics of the video or audio files based on spoken words and visual cues. Topics in this model are sourced from IPTC taxonomy among others to align to industry standards. We’ve also enhanced the well-loved celebrity recognition model which now covers one million faces based on commonly requested data sources such as IMDB, Wikipedia, and top LinkedIn influencers. We make it easy to try out Video Indexer – just upload, process and review video insights using our web portal. You can even customize models in a highly visual way without having to write a line of code. There is no charge to use the portal; however, if you find the experience suits your needs you can connect to an Azure account and use it in production. Existing customers will find new insight and timeline panels that are available in the portal and to embed. These sleek new panels are built to support the growing number of insight visuals and are responsive to different screen form factors. Get started today using Video Indexer to enable deep search on video and audio archives, reduce editing, content creation costs, and provide innovative customer experiences. At this year’s IBC we’re showcasing progress towards a future where Cloud, Edge, and AI help the media industry compete and thrive. First up we’ve partnered with Dejero, Avid, Haivision, Hiscale, Make.TV, and Signiant to showcase “live production in the cloud.” Live cloud workflows have historically been a challenge and this demonstration will take us one step closer. We’re also showcasing how Azure Media Services can help deliver UHD/4K HLG streams from the cloud in partnership with MediaExcel. MultiChoice, a leading pay-TV operator for more than 12 million subscribers in Sub-Saharan Africa recently completed a pilot using a similar solution to deliver the first UHD live streaming event in South Africa. They found that Microsoft Azure delivered on the promise of a third party managed cloud solution with real-world effectiveness. You can learn more about these solutions at our booth at IBC or from this blog. From creation to management and monetization, our partners continue to innovate for you. Avid MediaCentral’s latest version that just shipped features the powerful MediaCentral | Search app which makes all production and archived assets — stored across multiple local and remote systems — accessible to every in-house and remote contributor. Other features in the latest release include rundown app for story and sequence editing, social media research app for quickly monitoring a story and working it into your rundown, publish app for distributing content quickly across social media platforms, and MediaCentral l Ingest for enabling OP1A transcoding into growing media for editing while capturing and playing out with FastServe l Playout. These services are all built on a new backend on Azure that enables faster deployment and high availability. Nimble Collective recently launched Nimble Studio offering which enables studios and enterprise customers to harness their favorite tools through a powerful and secure pipeline. They recently visited the Microsoft Store in Vancouver to demonstrate how simple it was to get a studio up and running. Prime Focus Technologies (PFT) has partnered with Microsoft to further strengthen its flagship product, CLEAR™ Media ERP, which currently handles 1.5 million hours of content annually. As part of the collaboration, PFT is migrating its data storage to Azure to provide uninterrupted service to CLEAR customers. Leveraging Azure’s best-in-class cloud services, scale, reach, and rich AI capabilities, CLEAR offers a reliable, secure, scalable, intelligent and media-savvy ERP solution globally. PFT will showcase CLEAR integrated with Microsoft’s powerful Azure cloud services at IBC 2018 – booth #7.C05. Dalet has integrated Video Indexer into Dalet Media Cortex, a cloud-based SaaS, to enable existing Dalet Galaxy customers to consume Cognitive Services on demand. Dalet Media Cortex uses Video Indexer generated metadata to augment the content production experience and its effectiveness. For example, the new Dalet Discovery Panel provides editors with contextual suggestions of relevant content matching their work in progress. Empress Media Asset Management (eMAM) has integrated Video Indexer into its flagship product, eMAM. eMAM is a flexible, scalable media asset management system that can work natively in Azure or in hybrid environments. Organizations can now use Video Indexer to enrich the metadata for current or legacy content. Zoom Media is a Dutch startup specializing in Automated Speech Recognition (ASR) technology. They have extended the speech-to-text capabilities of Video Indexer, currently supporting ASR for ten languages, to include Dutch, Swedish, Danish, and Norwegian. Microsoft and Zoom Media will present these new features at IBC Show 2018 in Amsterdam. Built on Azure, uCast’s data-driven, OTT Video Platform supports turnkey AVOD, SVOD, TVOD, and Live functionality. uCast’s content monetization platform recently launched Sports Illustrated’s signature OTT video service SI.TV on Azure. It will also host a new Advertising Video-on-Demand (AVOD) service for an Indonesian-based mobile telecommunications provider and their more than 60 million subscribers. Nowtilus, a digital video distribution solutions provider, has deployed its server-side ad-insertion (SSAI) technology for on-demand and live-linear scenarios on Azure. It’s integrated with platforms such as uCast and waipu.tv (Exaring) to offer industry’s best, standards-compliant stream personalization and ad-targeting in TV and VOD. StreamingBuzz has developed StreamingSportzz Fan App, an Azure-based solution that offers a highly interactive experience for sports fans, athletes, and coaches. The experience includes multiple angles, 360 video, VR, and AR modes with statistics and match analysis. They have also have created BuzzOff, an innovative Azure-based streaming solution for in-flight entertainment, that enables passengers on flights to stream offline DRM protected content to their devices without the need to download an app. Media Excel has introduced a hybrid architecture for live contribution and transcoding of UHD adaptive services based on its HERO product line. This architecture enables PayTV operators and content providers to deploy secure scalable live UHD OTT workflows on Azure by combining multiple in-sync encoder instances for a highly-redundant yet cost-effective offering. For a live demo of the end-end solution, please visit Microsoft (1.C27) and Media Excel (14.G18) booths at IBC. Telestream and Microsoft are partnering closely to support content producers, owners, and distributors as well as corporations in their journey to cloud video production and OTT distribution. With the recently launched Vantage and Telestream Cloud solutions on Azure, Telestream offers comprehensive hybrid and cloud-based media processing in Azure to enable broadcasters and content producers to reduce CAPEX, increase agility, and enhance security for global content production. Telestream has developed Wirecast S specifically for Microsoft Stream within Office 365 and is developing Azure-based video quality monitoring solution for virtual, cloud-based deployments. Microsoft has joined the Secure Reliable Transport (SRT) Alliance! Having pioneered adaptive streaming for the industry and seen the benefits of broad industry adoption, we believe in the need for a simple, scalable and efficient ingest protocol for supporting large scale live events from the cloud. SRT is a proven video transport that lends itself well for cloud-based live workflows. By joining the SRT Alliance, we hope to create broader support, enthusiasm and adoption. Microsoft will also feature an in-booth presentation theatre with customer, partner and product presentations scheduled throughout the day. Check out a detailed schedule of all presentations and speakers. If you are not attending the conference but would like to learn more about our media services, follow the Azure Blog to stay up to date on new announcements. Finally, a big thank you to all our dedicated and growing community of developers, customers, and partners that continue to provide valuable and actionable feedback.